Inflammation plays a huge role in nociception. And vice versa. In fact, they are dynamically linked in several ways, as described below. Inflammation in the tissues sensitizes nociceptive free nerve endings so that they fire at a lower threshold. This is why an inflamed area is very sensitive to mechanical stimulation and why anti-inflammatories reduce pain. Nociceptors can fire a nerve impulse not only from the free nerve ending to the spinal cord, but from the spinal cord to the free nerve ending. This is called an “antidromic” impulse, and it will cause the nerve ending to secrete inflammatory mediators such as substance P and CGRP. This creates neurogenic inflammation, and it is a huge and often unacknowledged player in various forms of pain. There is research showing that neurogenic inflammation plays a role in musculoskeletal pain, headache, respiratory infection, cough, allergic rhinitis, asthma, bronchitis, IBS, rheumatoid arthritis. We can appreciate the extent to which inflammation is neurogenic in origin, by examining research involving rats whose nociceptors have been removed by capsaicin. These rats are incapable of sending nociceptive signals and creating neurogenic inflammation. As a result, their inflammatory response to tissue injury is so muted that healing is impossible in a variety of contexts. No nociception means too little inflammation to create healing. The interesting implication is that a very big proportion of the inflammation we see anywhere is likely neurogenic. When a nerve becomes inflamed, it is only the connective tissue sheath (the perineurium) that becomes inflamed. The inner part of the nerve which conveys the signals is not inflamed. A nerve can become inflamed when the connective tissue sheath of a nerve is damaged. This will fire the nociceptors that innervate the sheath (the nervi nervorum - cool name), which will then fire antidromically to secrete some substance P and other flavoring to create a delicious neurogenic inflammatory soup on the nerve. When a nerve is inflamed, all sort of bad things happen. If you recall from part one of this review, ectopic nociception means the signal originates from the "wrong place" - somewhere in the middle of the nerve as opposed to the ending. The spinal cord will assume the impulse is originating from one of the nerve endings. To complicate matters further, nerves branch on the way from the spinal cord to their endings. Therefore, the spinal cord has to guess which of the several endings the impulse is coming from. This is an example of the fact that nerves are designed for sensitivity not specificity. In other words, they are very good at telling you there is a problem somewhere, and not very good at telling you exactly where the problem is. This is one of the many reasons, including more that are listed below, why the site of the pain is not necessarily the site of the problem. Another problem with ectopic discharge is that it can fire an antidromic impulse to the nerve ending which creates neurogenic inflammation at the nerve ending. Yet another negative effect of nerve inflammation is reduced axon transport. Axon transport is the process by which proteins are delivered from the cell body near the spinal cord to the nerve ending. When this process gets impaired, the nerve ending is sensitized so that it fires at a lowered threshold. So we have at least three ways that inflammation of a nerve can increase nociceptive signaling that will be read by the spinal cord as originating somewhere different than the actual site of the problem (which is the inflamed nerve trunk.) By the way, the inflamed area that is sending ectopic impulses is what David Butler calls an AIG - an abnormal impulse generator. 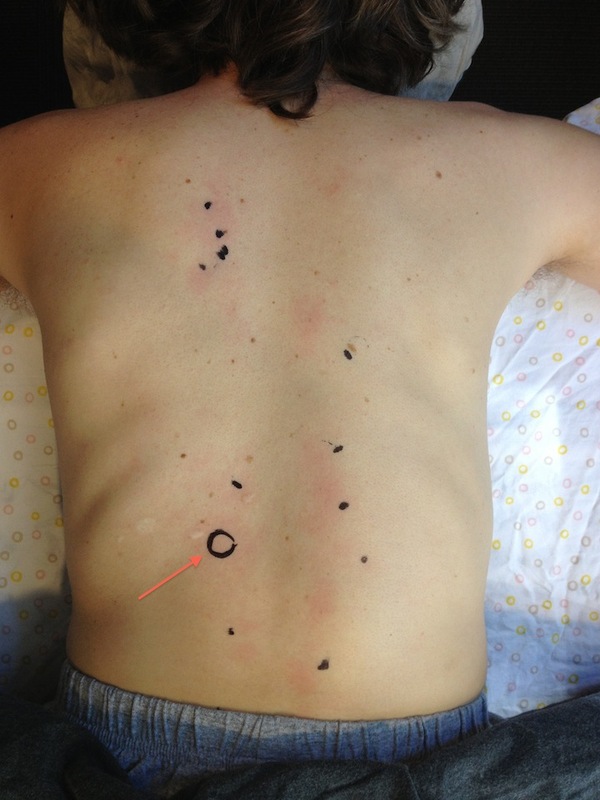 Bove agrees with Butler’s idea that AIGs might be what are commonly referred to as trigger points. More on that later. Contrary to common belief, a nerve will not fire ectopically in response to compression unless it is inflamed. Therefore, a "pinched" nerve is not a problem, but a pinched nerve that is inflamed is a problem. If we sit in a chair in a way that compresses a nerve that is not inflamed, we will get some numbness but no pain. But if the nerves are inflamed there will also be pain. So here we have a very simple and well researched mechanism by which nerve inflammation could be responsible for a great deal of the movement related chronic pains that we commonly see. This mechanism has a huge amount of explanatory power for many painful conditions, and yet most people don’t know that much about it. This is unfortunate, particularly since it could replace other ways that people explain pain that have far less support. Geoff has conducted research showing that massaging a rat’s belly after surgical incisions can prevent the accumulation of scar tissue and related adhesions. But Geoff is very skeptical about the idea of using manual pressure or even tools to alter mature scar tissue. Because the scar tissue is tougher than the surrounding muscle, any stretch stimulus intended to break up the scar tissue is far more likely to break up the surrounding muscle tissue, which will of course just create more scar tissue. In any event, he doesn’t consider the presence of a little bit of scar tissue within a muscle to be a significant factor affecting its extensibility. Geoff is very skeptical about the concept of trigger points. The workshop wasn't really about trigger points, so there was not much evidence presented on this subject, but he did state the following opinions. All the evidence looking for local pathology to support their existence is consistent with the presence of neurogenic inflammation. All the methods purporting to treat trigger points (such as dry needling) have been shown to be of little more effect than placebo. (I have previously found research that shows the same thing here and here.) In general, the entire discussion on trigger points is riddled with illogic, poor circular definitions, and lack of evidence. In this respect, he is in substantial agreement with the ideas set forth in this paper by Quintner and Cohen, which argues that what people consider to be trigger points are actually AIGs. Geoff plans to collaborate with Quintner in the near future on a paper discussing these and other issues related to trigger points. Geoff also pointed out that trigger points have some substantial problems with interrater reliability, and he devised an experiment in the class to point that out. He asked a woman who said she had trigger point type symptoms in a specific location on her back to lie down on the table. The other students, several of whom claimed some expertise in locating some of the alleged features of trigger points, such as taut bands, were invited to palpate her back and play pin the tail on the trigger point. To the right is a picture of the results. As you can see, there was zero interrater reliability, and no one located the painful spot. Geoff reviewed evidence suggesting that migraines are caused not by vascular disorder, but nociception from peripheral nerves. He suggested that reducing extracranial sources of nociception may be helpful in reducing migraine. Geoff attempts to treat some forms of nerve pathology by skin rolling, or pinching the skin and rolling it between the fingers. Sleep deprivation induces fibromyalgia type symptoms. The nucleus pulposus will be attacked by the immune system if it is exposed and is therefore extremely pro-inflammatory. The only feeling less pleasant than pain is "air hunger." People often hate ventilation machines because they interfere with the preferred rhythm and volume of oxygen intake. I found this idea very interesting and it contributed to a least a couple of my own thoughts. First, this idea lends support to the commonly stated opinion that clients will significantly sacrifice their movement or posture to maintain breathing in their preferred manner. Second, this explains why water boarding is an effective form of torture even though it does not cause "pain." Now which of these insights can I use to help my clients? Why not try both! I really enjoyed this seminar for several reasons. Geoff really knows what he is talking about. He has had his hands on all the structures that he referenced. He knows how to dissect them out, measure their activity with sensitive instruments, and manipulate the variables that control their function. This is painstaking and detailed work! Normally when I read some form of information in a paper about how the nerves work, or how they transmit impulses, I am not asking: "how the hell do we know that"? Geoff spent a lot of time in the seminar explaining exactly how the hell we know about pain, nociception and nerves. Like other scientists who are involved in gathering all the hard data to prove that we really know what we think we know, Geoff clearly stated the limits of his knowledge (even though it is encyclopedic) and was very willing to admit that he doesn't know the answers to questions that, paradoxically, many people with far less knowledge will claim confidently to have an answer about. In sum, it was a good learning experience. Thanks Geoff for the excellent seminar.